A tasty and more refined recipe of Turkey and Rice. 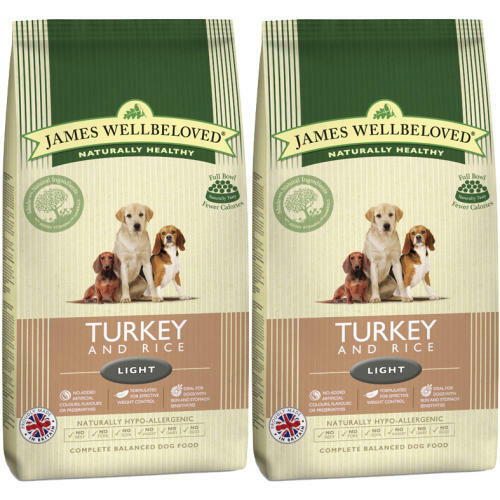 Highly digestable and great for managing the weight of your adult dog. Higher protein to help encourage loss of fatty tissue rather than muscle tissue. Composition: Rice, turkey meal, oats, sugar beet pulp, whole linseed, pea protein, turkey gravy, alfalfa meal, turkey fat, natural seaweed, sodium chloride, omega oil supplement, potassium chloride, parsley, nettle, chicory extract, calcium carbonate, glucosamine, yucca extract, chondroitin. Minimum levels: Turkey (26%), rice (26%), oats (19%), linseed (4%), turkey gravy (3%), alfalfa (2%), seaweed (0.7%), yucca extract (0.02%), chicory extract (0.12%), glucosamine (0.0275%), chondroitin (0.0225%), parsley (0.1%), nettle (0.1%). Additives per kg: Antioxidants: E306/Natural antioxidant, 174mg, Vitamins: E672/Vitamin A, 17,400 iu, E671/Vitamin D3, 2,610 iu, Trace elements: E1/iron, 47mg, E2/iodine, 2.3mg, E4/copper, 5.8mg, E5/manganese, 29mg, E6/zinc, 117mg, E8/selenium, 0.2mg. Analytical Constituents: Protein 26%, crude fibres 4%, fat content 10%, crude ash 7.4%, Vitamin E 175mg/kg, omega-3 fatty acids 1.2%, omega-6 fatty acids 2.6%. Energy Value (ME) 350kcals/100g.